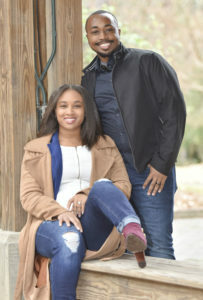 Met: A’Khi and Raven met in 2006 at New Birth Family Church when they were both in the teen ministry. Raven said she was friends with A’Khi but nothing more. “We were just a group of teens who went bowling and skating together,” Raven recalled. “I had no interest in him then.” A’Khi felt differently, though. “I liked her.” By the summer of 2012 the two had become best friends. 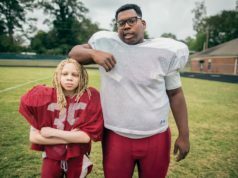 “I had seen her with all of her boyfriends,” A’Khi said. Shortly after Raven broke up with a boyfriend the two began talking more and the idea of being in a relationship surfaced. “I really prayed about it and him,” Raven said. “I started to see his love for God and I could see his heart.” Raven said she and A’Khi were very different — she was an extrovert and he was a quiet homebody. A’Khi did not think that those differences should keep them from being together. After more prayer, Raven decided to put her trust and faith in A’Khi. 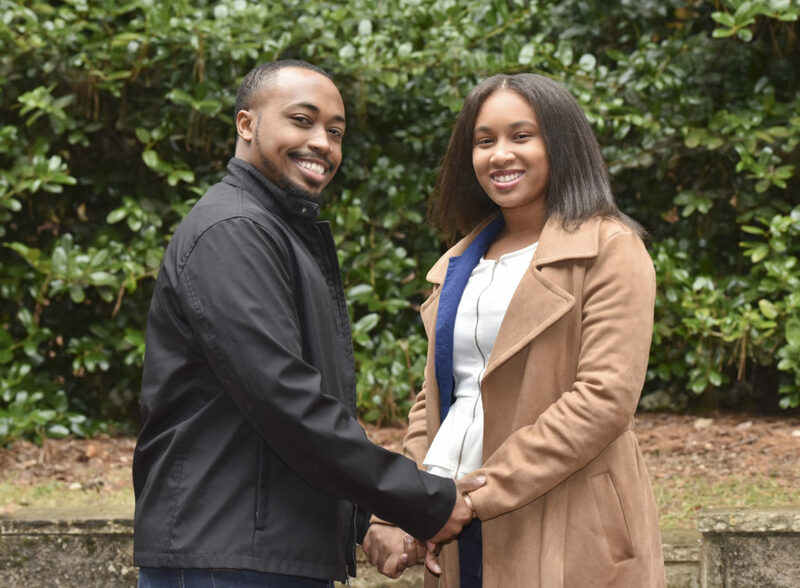 Just as their relationship was getting started, A’Khi left for Tuskegee University. 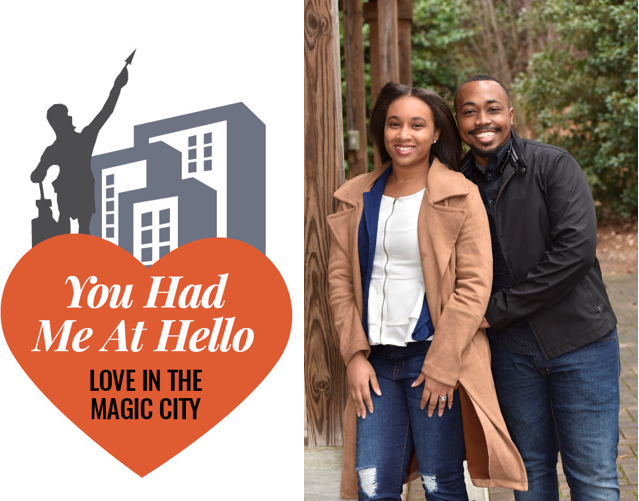 First date: Because A’Khi was away at Tuskegee and Raven remained in Birmingham, it would be nearly two years after they began dating before the couple would actually go on a real date. “We mainly saw each other on Skype,” Raven said. In 2014 they finally went to Chili’s Restaurant in Trussville. “I had saved up just enough money to take her out,” A’khi recalled. Take Two: A’Khi and Raven spent six months apart before reconciling. One of the things that sparked the reconciliation was a chance meeting between A’Khi and her father at church, Raven said. “They met and clicked immediately,” Raven said. 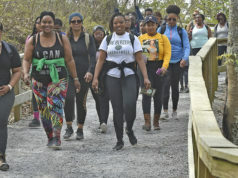 “My father encouraged me to unblock him and to talk about what I was feeling.” Raven said that meeting and her father’s approval of A’Khi ultimately led them back together. On Christmas 2017 A’Khi, with a new engagement ring, proposed to Raven for the second time. The wedding: The couple wed at the Trussville Civic Center. Raven remembers being nervous and shaking before her vows, but her nerves calmed after she walked down the aisle. “That day was amazing,” she said. “I was just very grateful.” A’Khi said he was not nervous, but instead excited about beginning their journey as a married couple. Words of Wisdom: The couple said they have learned a great deal in nearly one year of marriage. “I have learned how to yield,” he said. 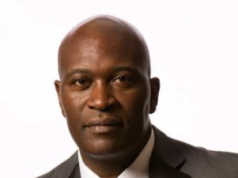 “It is important to yield and to listen and try to understand (your spouse),” A’Khi said. Happily ever after: Raven and A’Khi enjoy going to the movies. Raven likes to travel, while A’Khi likes to spend time at home, hang out with friends and play pool with his team. Raven, a native of Selma, is an aspiring dancer and actress. She teaches dance classes and also works on the staff at Danberry Assisted Living. A’Khi, a Birmingham native, works for the Birmingham Water Works.